This brief video shows how to create a Hello World project with SlideFab 2. 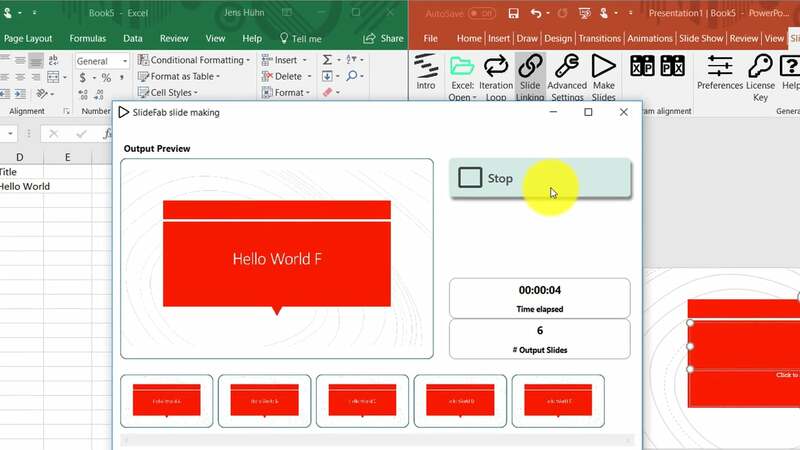 It will be explained how an Excel workbook can be set up and linked with Powerpoint such that multiple slides with different "Hello World" titles are created through SlideFab automatically. 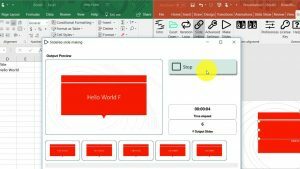 The example in this video keeps things very simple as it writes formula-based texts from Excel to Powerpoint. However, SlideFab can do more than that. And in fact, bringing tables, charts or images from Excel to Powerpoint is very similar to what is shown in the video. Here you will also find the Excel workbook and Powerpoint presentation file as download, which can be tried out with SlideFab 2 right away. Posted in Example, Tutorial and tagged Example, Excel, Powerpoint, Presentation, SlideFab 2, Workbook.